For twenty-seven years, the Hebron Eagle Rock, positioned along route 66 heading towards Marlborough, has been iconic. It’s been mentioned in several newspapers multiple times over the years, it’s been used as a symbol throughout the town including the town website, and the eagle has become the Hebron Elementary School mascot. The Eagle Rock has become a Hebron legend, and one of the top fifty landmarks throughout all of Connecticut. It certainly has “made its mark” says the Eagle Rock creator himself, Jason Sawyer. 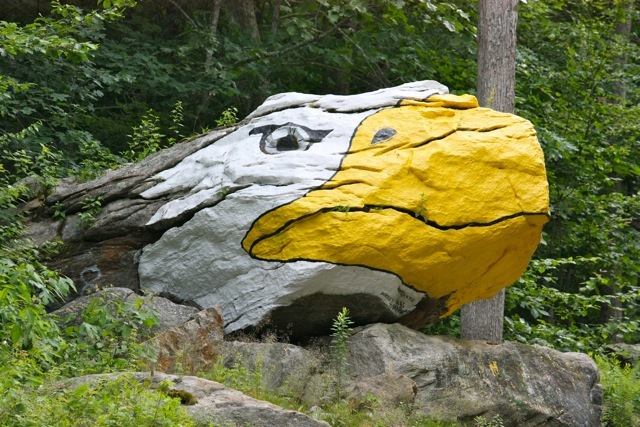 It wasn’t until 1989 that Jason Sawyer, a former Hebron resident, and now a Senior Art Director for AetherQuest Solutions in Virginia, painted the rock into an eagle. Jason claimed he was a bored teenager looking for something to do in the summer before his senior year at RHAM High School. He remembers the seniors painting the senior rock at RHAM High School (a tradition still held today), which at that time included many references to the first Batman movie that had just come out. This piqued Sawyer’s interest as a teenager looking for something to do in a small New England town. Sawyer had noticed the rock as a landmark along route 66 since first moving to the town when he was five or six. Before it was an eagle, urban legend claims that the rock had been painted into a variety of different things, from a monster to a frog, though it never stayed long enough as a single entity. Sawyer only remembers seeing the remnants of paint wearing out atop the rock. Sawyer contacted the state and got approval to paint the rock into the image of the eagle he had seen driving by. Since painting the eagle back in 1989, Sawyer has been back to Hebron at least four to five times to repaint. He hasn’t been alone. He’s had individuals help him repaint the rock, along with various families within the town who have helped to “color in the lines” and maintain the trees and shrubbery around the area of the rock. Together they have helped to uphold the historic site of the great Eagle Rock of Hebron, Connecticut. According to Sawyer, the “greatest part was that I did it, and didn’t think much about it.” Yet, the rock has become a legend, storied in several newspapers over the years, as well as the Channel 3 News. The rock wasn’t just the artwork of a teenager looking for something to do. Rather, it had become a phenomenon, a “beakon” into Hebron for those entering eastward along route 66. Today, the rock still sits as a landmark along route 66. It has been repainted over the years, and has had some minor changes by various residents within the town who intend to hold the eagle’s composure. 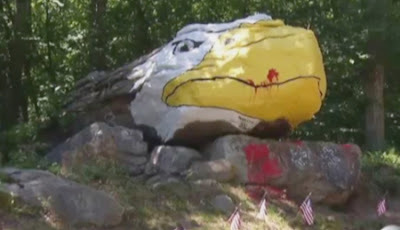 The Bordick family, who are local residents of Hebron, cleaned and repainted the rock back in 2011 after it had been vandalized shortly after Independence Day. Not only did Andy Bordick clean up the vandalism, he refurnished the Eagle Rock. He added some minor renditions to the eagle’s eyes, depth, and 3D structure, so as to enhance the foundation and the composure of the rock for years to come. 2011 was not the first time the rock had been vandalized, however. Sawyer mentioned that the rock had first been vandalized in 1991. People had vandalized the rock with political statements and symbols relating to the United States invasion of Iraq. The vandalism didn’t cause a setback to the Eagle Rock, however. Residents of Hebron stepped up and chipped in to uphold one of the town’s greatest traditions. Sawyer mentioned that vandalism will always occur at one time or another, though having a town of supportive residents who care will mend our town’s tradition and heritage. Jason Sawyer doesn’t always get the time to go back to Hebron to see his Eagle Rock, but he knows it’s still standing, and in very supportive hands. Living in Virginia, Sawyer admits that it “gets harder and harder to come back to Hebron,” but he hasn’t passed up the opportunity when he gets the chance. Although he is now living in Virginia, Sawyer mentions that he intends to plan a trip back to Hebron to paint his Eagle Rock once again, as it needs another face lift. After twenty-seven years, Sawyer admits that “he never thought the rock would last this long.” But indeed, the eagle rock still stands, and it has become a phenomenon greater than just a work of art. We, as residents of Hebron, must share in the pride of Hebron by helping to maintain and sustain the great Eagle Rock that is so representative of our town. 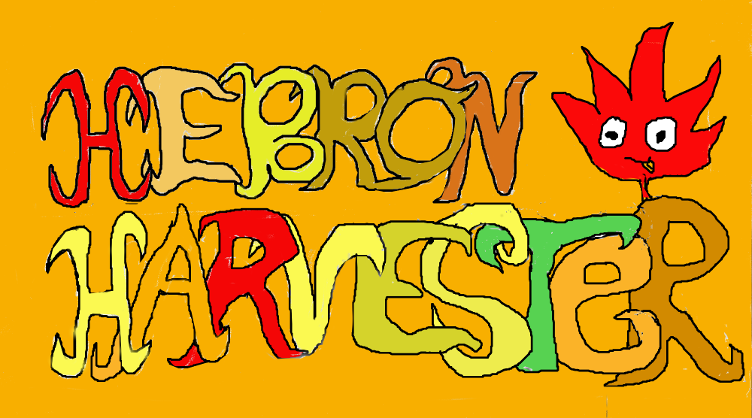 And, as always, post to the blog and/or email your stories, pictures, reviews, and thoughts to hebronmapleleaf@gmail.com.